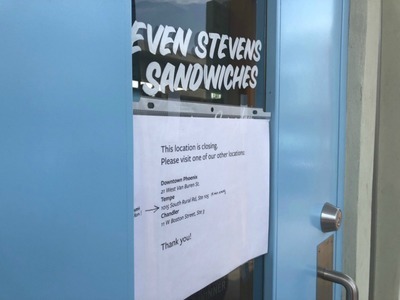 In the last few weeks, several Even Stevens Sandwiches locations have abruptly closed their doors. Restaurants in Arcadia, Gilbert, Peoria, Scottsdale and Tucson shuttered with little to no public explanation. Restaurants in downtown Phoenix, Chandler and Tempe remain open. Lauren Singer Katz, brand director for Even Stevens, said in an emailed statement on Wednesday that the Utah-based sandwich concept began restructuring in early July focused on cutting corporate costs and accelerating revenue growth. "The decision to close the locations in Arizona, while difficult, was a necessary step to get the company back on track," the statement said. Brooks Pickering, the company's LLC manager and chief restructuring officer, said in an emailed statement: "Unfortunately, some prior business decisions have put us in a difficult position. We are confident the steps we are taking and the path we have charted will ensure the long-term viability of the company." The company also confirmed that it has temporarily stopped its charitable giving, one of its main marketing and advertising points, though they do plan on restructuring it. "While we acknowledge the many good things that have come from our partnership, the model, as it stands today, is simply not sustainable,” Pickering said. Under the program, Even Stevens locations would partner with local organizations and help provide funds to purchase sandwich ingredients. You can read more about that, here . More than three million sandwiches have been donated to different organizations nationally, the company said. 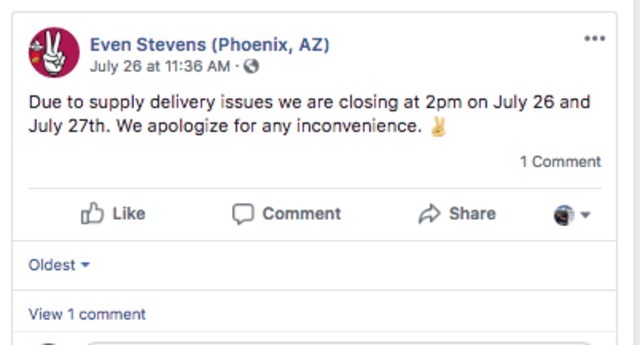 Toward the end of July, Even Stevens restaurants in Chandler, Scottsdale and Tempe temporarily closed citing "supply delivery issues," according to posts on the restaurants Facebook pages. None of the local restaurant's Facebook pages acknowledge the closures. "Farewell Gilbert Evies," read a sign posted to the door of the Gilbert restaurant. A notice on the door of the Arcadia restaurant said the landlord had taken control of the space after the tenant failed to pay rent. In July, the company's former president Michael McHenry announced he had left in June to launch a new restaurant group in Utah.